DUBAI, United Arab Emirates, Oct. 8, 2018 /PRNewswire/ -- Citizens and residents of Dubai will be able to make digital payments for school fees, bills and retail purchases with a stable, digital currency after a partnership between blockchain payment provider Pundi X, Ebooc Fintech & Loyalty Labs LLC (Pundi X's exclusive partner in Middle East & priority partner in Africa) and emcredit - Dubai's Credit Bureau. Consumers in Dubai, UAE will be able to use digital currency to make retail payments in-store, pay for government utilities, telecommunication, and school fees in government shopfronts via emcash – Dubai's digital currency launched by emcredit, a state-backed subsidiary of the Dubai Department of Economic Development. 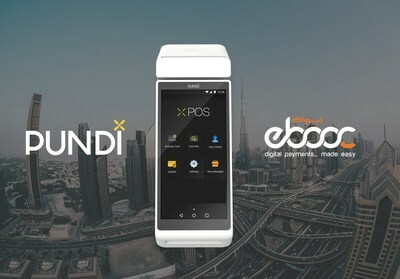 The bespoke, Pundi X POS ("point of sale") device created for ebooc fintech & loyalty labs for the exclusive use of emcredit with their branding will be dedicated to running a stable, digital equivalent of the UAE dirham (AED). Ebooc - the first Emirati fintech company is the exclusive partner of Pundi-X and providing blockchain-based NexGen technology and loyalty solutions for the financial services sector. Today's announcement confirms Dubai's status as a global blockchain innovation centre and the first global capital to afford citizens the option to make essential payments on a digital currency. XPOS devices are expected be rolled out at shopfronts the region following today's deal with provisions for an increase in coming years. An emcredit spokesperson said: "We are committed to continuously improving the services we offer to our customers in accordance with the directive of His Highness Sheikh Mohamme Bin Rashid Al Maktoum, UAE Vice President and Prime Minister and Ruler of Dubai. "To be the world's first city to offer blockchain-based payment solutions to our residents is an exciting moment for Dubai. It confirms Dubai's status as an international tech hub. Deploying cutting-edge technology such as blockchain is a key priority and is delivering benefits to our citizens in the form of convenience and securities to customers and merchants across Dubai". Zac Cheah the CEO and co-founder of Pundi X said: "Bringing blockchain-based payments technology into the government sphere is a major development for the technology. "But to be able to bring it to one of the great cities of the world and the most advanced economy in the Middle East makes today an historic moment for the real-world application of a technology that has promised so much potential until now. We are very proud to partner with emcredit and to support its vision for supporting its customers through technological innovation". Abdalla Al Shamsi, CEO DFP and Co-Founder ebooc said: "We are delighted to be a part of this historic partnership when Dubai launches the world's 1st first digital currency – emcash. We also envisage consumers in Dubai being able to make real time payments using Dubai's digital currency for all their payment needs for shopping, paying for Government fees etc. ebooc is also looking at extending its reach as an exclusive POS partner of Pundi X". Sunil Malhotra, Managing Director Bchain and co-founder of ebooc said, "emcredit-ebooc– Pundi X partnership will deliver a differentiated customer experience through innovative POS products and service for consumers in Dubai bringing together various service providers under one platform." Further details of the partnership will be announced following the development, testing and approval of the technology by government regulators later this financial year. Pundi X are shipping thousands of its payments devices to the global retail market, including retail partners in markets such as Singapore, Brazil, Africa and Korea, just eight months after raising $35-million in startup funding in a public token sale in January. This partnership brings world-leading, blockchain-based XPOS technology into a public sector environment for the first time and is the company's first deployment in the Middle East region. The company is targeting a rollout of more than 100,000 of its unique blockchain-based POS devices to the global retail in three years' time. emcredit is the Dubai's first credit bureau which launched operations as a federal corporation established by the Ministry of Finance. emcredit is a 100% subsidiary of the Dubai Department of Economic Development (DED) and works with the UAE banks to provide real-time data on individuals and enterprises. ebooc is the first Emirati fintech and loyalty company in Dubai and the region and aims to use emerging technologies to harness their power for the good of consumers. Ebooc provides blockchain loyalty programs, mobile digital wallets, NFC card products and a secure and seamless payment experience to clients and customers running on NexGen technology as a decentralized, distributed ledger which creates trust and improved efficiency levels. Pundi X is a multi-cryptocurrency point-of-sale ("POS") solutions provider for retail stores seeking to accept digital currencies in the world. Pundi X POS enables shops, cafes and convenience stores to facilitate blockchain-based transactions for the average consumer. To build a better cryptocurrency ecosystem in different countries, Pundi X is a founding member of XPOS Consortium and Indonesian Blockchain Association. The company is also a member of Singapore Fintech Association, Fintech Association of Hong Kong, ACCESS, and Swiss Finance and Fintech Association.